Food and Fuel America.com: Why Don't They Care About $3.00 Gas Anymore? Oh what two years and a change of politics brings. Two years ago, lawmakers on both sides of the aisle in Congress were furious about the rising cost of gasoline, the impact upon consumers and sky-high oil company profits. This week, pump prices again topped $3.00 and barely a whisper is heard from anyone. The American public is more accustomed to high prices, despite the financial pinch. Oil industry profits are retreating from year-ago levels as the soaring cost of crude crimps refining revenue. The outrage many Democrats expressed back then over high energy prices has been tempered by the fact that their party now controls Congress, making finger pointing more difficult. Plus, lawmakers have their hands full with a worsening housing crisis, a four and a half year old war in Iraq, and spending bills that have yet to be completed. What's closer to the truth is that the Democrats now control Congress. It's so much easier to blame someone else when you're not holding the gavel. Now that they are in charge of both the House and Senate, the leadership seems to have forgotten about the impact of higher oil costs. It must have just slipped their mind. Hmm. But there's an oily trail from the oil fields tracked right on through both chambers and to both parties. OpenSecrets.org, created by the Center for Responsive Politics, is a good site for checking for "the rest of the story". 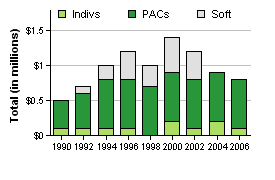 According to the OpenSecrets.org website, ExxonMobil has contributed more than $9.2 million dollars to campaigns since 1990. And Chevron even beat that with over $9.4 million dollars in contributions. This slick path sure helps when it's time to beat down any competition to oil.